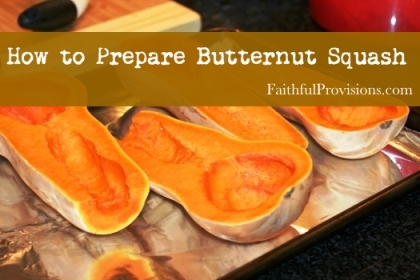 If you’ve never tried it, it’s time for you to experience cooking butternut squash! Butternut squash has a nutty taste that is similar to pumpkin, but still, a distinct squash taste, sweeter than other squash. I will admit that I do think butternut squash is difficult to work with. It’s really hard to cut, so rather than cut it and peel it with a knife, I recommend that you use a vegetable peeler. In spite of its difficulty, once you have tried a few recipes with butternut squash, or just served it roasted, you will agree that any extra time and effort on your part is absolutely worth it! It is unbelievably good. Cut in half length-wise from stem to stem. Take a melon scooper or a sharp spoon to clean out the guts, like you would a pumpkin or a cantaloupe. It is a bit trickier however, in that the guts of a butternut squash are a little more stubborn. Take a melon scooper or a sharp spoon to clean out seeds and string. Lay on baking sheet with flesh side up. Roast on 400 degrees for 30-35 minutes. You can learn how to cook squash using five different methods HERE.